Three French favorites bring hearty reinforcements to greens. Here we have three French bistro classics -- salads that balance bright, crisp greens and tangy vinaigrettes with rich ingredients: bacon and poached egg, rounds of baked goat cheese, and a combination of beets, nuts, and blue cheese. These comforting meals provide a dose of cheer and fortification in the midst of winter’s whipping winds. And croutons can add crunch and substance to many dishes, including this Salade Lyonnaise. In a medium saute pan over medium-low heat, heat the reserved bacon fat until it begins to bubble, about 30 seconds. Add the shallot and cook, stirring frequently, until it starts to soften, about 1½ minutes. Add the red wine vinegar and scrape the bottom of the skillet with a wooden spoon to loosen and dissolve any brown bits left if you fried the bacon in the same pan. Off the heat, whisk in the mustard to combine, and then the oil. Add ½ teaspoon salt and pepper to taste, stir to combine, transfer the dressing to a small bowl, and set aside. Wipe the pan clean, fill it three-quarters full with water, set over high heat, and heat almost to simmering. Stir in the white vinegar and 1 teaspoon salt, and crack an egg into a teacup. Lower the rim of the teacup into the water, allowing some water into the cup, and hold it in place, without pouring out the egg, until the egg white begins to turn opaque, about 30 seconds. Gently pour out the egg into the near-simmering water. Add the remaining eggs in the same fashion. Poach until the whites are set and the yolks are warm and slightly thickened but still liquid, about 4 minutes. Gently remove the eggs to a paper-towel-lined plate as they become done, and set aside. In a large bowl, toss the frisee or endive and greens with the dressing. Divide the mixture among 6 plates and sprinkle each with a portion of the bacon. Place 1 egg on each salad, sprinkle each salad with chives, if using, and serve at once. Hazelnuts add nice flavor and texture to the coating, but they are not traditional. If you wish, use ¼ cup bread crumbs instead. Have on hand 2 shallow dishes such as pie plates. In a food processor, process the melba toast, nuts, half the chopped shallots, ½ teaspoon salt, and pepper to taste until you have fine crumbs, and transfer them to one of the shallow dishes. In the second dish, beat the egg with 1 teaspoon of the mustard. Coat a piece of goat cheese in the egg and then gently press it into the crumbs, turning to coat all over, and place on a plate. Repeat with the remaining cheese, then freeze the rounds until very firm, about 40 minutes. Meanwhile, set the oven rack in the top position and heat the oven to 475 degrees. In a medium bowl, mix the vinegar, remaining shallot and mustard, ½ teaspoon salt, and pepper to taste. Whisk in 3 tablespoons of the oil. Taste the dressing and adjust the seasoning with additional salt and pepper, if necessary, and set aside. Set a wire rack on a baking sheet. Transfer the frozen cheese to the rack, brush the rounds lightly with oil, and bake until the coating is deep golden brown and the cheese is slightly soft, 9 to 14 minutes. Remove the rounds from the oven and cool for about 2 minutes. Meanwhile, in a large bowl, toss the greens, the apple or pear, if using, and the dressing. Divide the greens among 6 serving plates, place 2 cheese rounds on each salad, sprinkle with some of the chives, if using, and serve at once. Walnut oil is a wonderful accent here, but olive oil alone is also good. In a small bowl, mix the vinegar, mustard, ½ teaspoon salt, and pepper to taste. Whisk in the olive and walnut oils to blend. Taste the vinaigrette and adjust the seasoning with salt and pepper, if necessary. In a large bowl, toss the beets, the mache or watercress and greens, the shallot, and the cheese with about three-quarters of the dressing. Scatter the walnuts evenly over the salad, drizzle with remaining dressing, and serve at once. 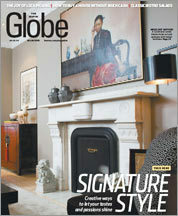 Send comments or suggestions to Adam Ried at cooking@globe.com. 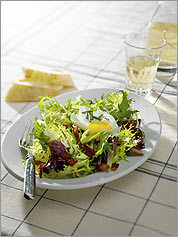 (Photograph by Jim Scherer; Styling by Catrine Kelty) Nice bite A dressing that's sharper than the usual vinaigrette helps balance the rich bacon and egg that make this salad a meal.